Iâ€™ve partnered with the amazing OPEN EYE CRYSTALS in honor of their Solar Return! Ahh love me an Aquarius baby! 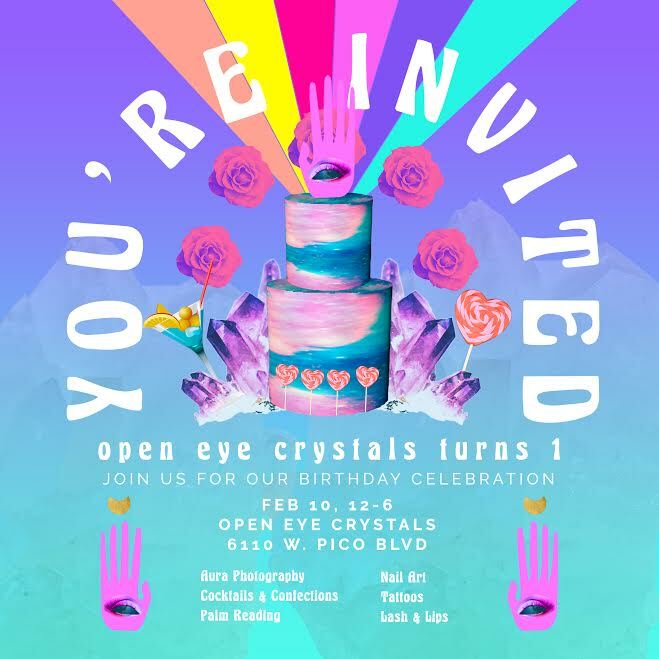 So I will be sharing space with fellow light workers celebrating one year of Open Eye elevating Los Angelesâ€™ consciousness- one crystal, sage bundle and intention candle at a time! Come say hi! Get a super discounted mini Sun x Moon reading with me and check out all of the beauty being brought to you by other special vendors and Open Eyeâ€™s GORGEOUS selection! It's all written in the stars! Get to know yourself on a deeper level with mini sun and moon readings. Christina shares your deep emotional needs (moon) and how you can shine your brightest (sun) with meaningful interpretations that are fun and insightful. LOL this candle is the ultimate modern day â€œhexingâ€� flame!